We were always into airplanes at my house, growing up. My dad had worked at Douglas Aircraft “during the war”… and he really knew his aircraft!. When my mom needed a break, my dad would take three or four of us kids out to the Burbank Lockheed Airport and we’d park… and we kids would run-around outside the fence located at the head-end of the runway… we’d watch those four-engine airliners rev-up/warm-up before they released the brakes and headed-out at full throttle away from us. I remember seeing those cowl-flaps open-up to reveal the glowing red-hot exhaust manifolds… and then that blast of heat, smoke, and dirt as the brakes let go and those big babies blasted away from us… and SO LOUD (clap your hands over your ears! )… what a rush… awesome! 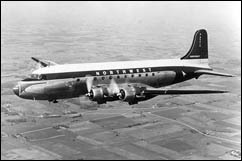 … Not much security in those days… we’d have been like thirty feet from the airliners… standing in the grass behind a simple 10-foot wire fence. 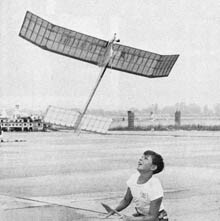 My first memory of flying a model airplane was me in about third grade (1960?) 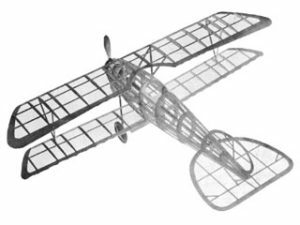 when my Dad gave me a Guillows WWI Albatros rubber-powered stick-and-tissue bi-plane kit. We worked on it together… meaning he saw that I got a start and then he let me go at it! Seems like I remember that it took forever to build that kit; glue all over the place. I covered it with the included white tissue and several coats of clear dope. That fragile, simple landing gear was broken and gone even before I gave it my first toss! … and I recall giving it only about THREE tosses out in the backyard before it was simply destroyed in those multiple crashes… never did get a “nice” flight out of it. … After that, I DID try some other, more simple stick models with a bit of success. 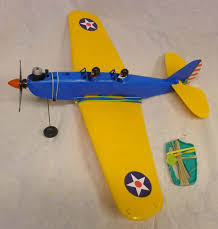 Then I was birthday-gifted a Cox PT-19 control line trainer (blue with yellow wing and tail feathers)… Baby Bee .049 and the model was assembled with rubber bands so the plastic plane could survive a crash… and CRASH it, I did! As per the instructions in that box, before flying it for the first time, I stood in a corner of my family’s living room and twirled around and around as a way to get ready to stand in the center of that control line circle. Then I crashed the first dozen flights, didn’t get a whole circle before crashing. My Dad was frustrated with me, I was frustrated with the whole thing! But then, I remember that my Dad discovered that the control handle had the strings attached at the “Beginner” position with the two strings only like 2-inches apart on the little handle… I guess to reduce the control throws. He moved the strings out to the top and bottom of the handle, now 5- or 6-inches apart, for maximum control… and that DID it… I could then fly-out a whole tank of fuel and make a landing! It became fun! 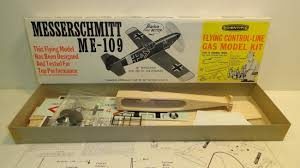 In eighth grade I joined a model airplane club and started to fly control line with the Big Boys… .35-sized Ringmaster (McCoy Red-Head 35) and Flight Streak (K&B Torpedo 35)… 60-foot steel lines and a nice handle that had a crank on it so that you could wind-up the lines onto a reel inside the handle… convenient… so professional! That lasted two years… and I faded out of the scene. 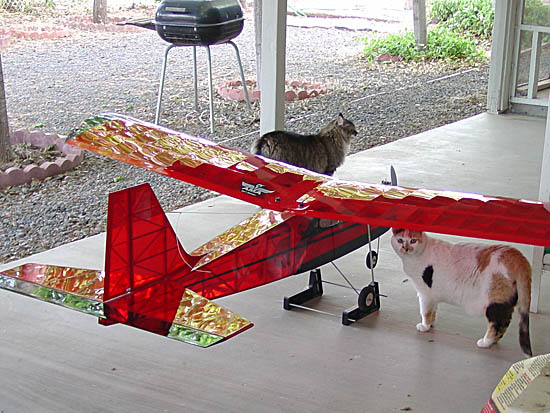 … ALSO about that time, I built a polyhidral free-flight kit with a Cox .049 on the nose. As per a free-flight sailplane, it was supposed to have a dethermalizer fuse… an actual bit of heavy string soaked in saltpeter powder that when dried, burned hot like a bit of firework fuse… and it was supposed to burn-through a rubber band that was holding the horizontal stabilizer in place; when the band broke, another band would tilt the tail-wing up for a full up elevator effect. ANYWAY… for its first flight, I filled the tank for a full three- or four-minute engine run… I did not use the dethermalizer fuse… I started the motor, tossed the model and… it did a big slow swooping circle and then started to climb straight away from me: up, up, up. That motor kept running until the model was out of sight. … never saw it again. Then in high school, a couple of friends and I flew .049 combat with those hollow-log Scientific WWII fighters. Each of those kits looked identical except for the shape of the wing… and that wing was a plank of 3/16″ solid balsa wood… no dihedral… and cut to the outline of a Mustang wing for the Mustang or like a Hellcat wing for the Hellcat. We also built actual combat models… like the Lil’ Satan. I enjoyed that for a couple of years. 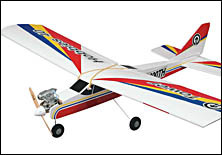 In college (Cal Poly, San Luis Obispo) I built a Guillows Cessna 150 stick-and-tissue kit. This time I added a firewall and mounted a Cox ,020 motor. That thing flew free-flight… but was so heavy with plenty of colored dope, and with an already used/abused little motor, that plane was the perfect baseball-diamond free-flight model. It didn’t go very high, 15-feet?, hanging on the prop in big lazy tail-heavy circles around the school yard. Kind of fun, actually. Sometime in 1997 or ’98 my 16-yr old son and I visited the Santa Barbara model airplane club. They were flying off a rancher’s full-scale airstrip located up in the hills behind Santa Barbara. They had a “program” in which any newbie could show-up on any Saturday at about 8 AM and find a teacher with a fueled trainer, ready to buddy-box fly. We went out there a few times and flew “the pattern” with the teacher doing all of the taking-off and landing… mid-throttle several laps before handing-off to the next “kid”. Then, later in 1998, I bought a Tower Hobbies “Tower Trainer 40” “Ultimate Combo” and got the ARF with a Tower 40 motor and a Tower 4-channel FM radio with servos… everything I needed in one big box. I also bought a Hobbico field box (which I spray-painted green and am still lugging-around today!) with battery (with power panel) and electric fuel pump. My idea was that this hobby would give me and my teenage son a common interest… something we would enjoy, together. …. he lasted about three months… and dropped-out… Me? … I was hooked! … At Christmas of ’98, I bought him an O.S. 40-LA… nice motor. In about 2005 I took it out of its NIB box and mounted it on one of my OWN models. I did not go back to the S.B. flyers… instead I found a dirt road near some orange trees by a housing project… and I taught myself to take-off and land. LATER I found that my control throws were pretty extreme! … no wonder that trainer seemed nearly out of control most of the time that I was learning on it! The rest is History! … I flew with the Ventura Comets for several years, lakeside at their little black-top-paved Lake Cassitas model airport in a county park in the hills above Ventura. … and then I moved out to Kingman in 2005 and promptly joined the Modelers. Then with the start of the Golden Eagles RC Club in late 2017 and my subsequently being banned from the Modelers, I have been happily flying with the Eagles in our new Aux. Field #1. Nice club, the Eagles… great people, nice ideals, fun camaraderie, nice facility… a joy to be associated with the Golden Eagles RC Club of Kingman, AZ. Back in 2011, I finished my Sig “Kadet Senior” … here it is… checking the balance for the first time, 2011. Everyone, I mean EVERYONE watches Eric fly his Kadet Sr., especially in a breeze. Our terrific Webmaster also allows pylon or sport planes to fly freely while he is up. It is difficult to fly and not be try to watch the Kadet ballet. and backward landings, I’ve seen it! The wind is his friend. And when he does not fly, I don’t even think about it! Flying that is!